Manon Lutanie: You just got back from a residency at Banff in Canada as part of the Critical Art Writing Ensemble Residency. What did you work on there? Rachel Valinsky: I am editing a book in collaboration with the painter Alan Reid. The book will be published in May 2016 to coincide with the opening of his next solo exhibition in New York. 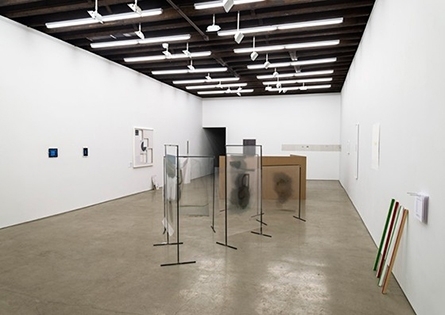 The residency was conceived as both as a forum for group discussion and reading on the arguably emerging field of "art writing," and a time for personal work. I had proposed to work on my introduction to the book, which is not really an introduction at all, actually. I didn’t quite know what the text would look like, but I had an idea that it would have to do with cinema — especially French films from the 90s, Éric Rohmer's in particular but others as well — and then with mirrors, the portrait of a woman, fashion and its system (as Barthes writes). So you are both responsible for selecting authors for the book, and yourself authoring a text for it? Yes exactly — everyone is currently at work on their texts. After three weeks at Banff, I finally wrote the beginning of the text, three pages that felt really full to the brim. It’s a long poem, a kind of script. I was reading poems by Lisa Robertson, and books by Anne Cason in the afternoon, and would watch films late at night. I stopped every now and then to write. What’s the first sentence of your text? It begins with a quote: "The form of jottings, rather than an essay (…) seemed more appropriate for getting down something of this particular fugitive sensibility" (Susan Sontag, Notes on Camp). There are quotes everywhere throughout the text. This idea that writing — or rather the act of writing — is completely embedded in the practice of reading is really important to me. And we discussed it at length with the group of residents at Banff. Reading as a modality of writing, it’s inextricable. Do you think that the context of the mountains led to something in your way of writing, of working? Yes, all of a sudden, having the time to read gave me the time to write. And I experienced a great freedom of form, perhaps because of the vast landscape that surrounded me. I thus felt comfortable writing a text that would in some way be part of the decor. Is it not precisely the very notion of the critical text as decoration that you are contradicting with this project? I think the idea was to treat the critical text (if it even needs to be called critical here) as a constituent element of an ambiance. If we agree that the theatrical chorus at times exerts a critical function on the action or on the characters, we rather imagined that the action could be Alan’s work just as well as it could belong to the visitors of the exhibition. There is a reversal, where the principal interest of the “action” could be the spectators and not the object observed. I think this reversal changes the tone of critique, diffuses it. Instead of speaking all at once, as it does in classical theatre, the chorus here is dispersed, its voices tell us different things. And instead of delivering judgment on a common subject (here, the subject of the book, we could say, the artist himself), the subject slips away, sneaks away from the book. We are left with a collection of texts that constitute a certain mood. When did you start curating? When I was at Columbia University, there was a small gallery on campus, in the basement of a chapel, called Postcrypt Art Gallery. I started organizing exhibitions there with the students. Each of them only lasted one evening because the room was also used for weddings and other occasions during the week. So, little by little, we began to conceive of the opening as an integral element of the exhibition: exhibition as event. It was in 2010. I directed the gallery for two years. We mostly exhibited student work, but the project still felt pretty experimental for the university. There was a very committed team. After graduating, I organized a group of exhibitions in a gallery in Brooklyn, Peninsula Art Space, which is in a way, a kind of "project space." You have worked on the question of aphasia, with the exhibition "Itself Not So." Recently, you also organized a panel on the question of erasure, of removal. What is it that interests you in these questions of impediment, of negation, of impossibility, or of difficulty to speak, to write? For "Itself Not So" I wanted to bring together artists and writers for whom language didn’t seem to completely fulfill its signifying or communicative promise. It seemed like there was a blind spot in the way we talk about these practices in relation to one another (visual arts, performance, writing, all related through a special attention to language). This blind spot was also enacted at an individual level, in the work of the artists I included in the show. I think what has always most interested me is what seems incomprehensible, unavowable. I often find it reveals much in the way of potentiality. It’s all in the "seems." Exactly — and in trying to recuperate meaning or define some kind of language system out of what is apparently nonsensical. It’s a different case with erasure, where so much of the discourse surrounding it revolves around questions of authorship and appropriation, because erasure often uses found or existing texts. One of the artists on the panel, Fia Backström, was also included in the exhibition "Itself Not So" and thinking back to her work the term "dispossession" kept rearing its head. Inquiries related to language are central in your research, is that right? Yes, language in all its iterations. I was actually just about to quote this line from Brion Gyson and William S. Burroughs’ collaboratively written book, The Third Mind: "To possess one's own language within the sphere of language that possesses us so that we may finally be dispossessed of it." It’s a bit of a brain teaser, but I think it is a rather incredible proposition for an attempt to rehabilitate something that we are constantly being dispossessed of. In other words: the meaning of our utterances, which escapes as soon as words leave us. It’s a paradox from Japanese Renga poetry. Anyway, I like finding myself in the complicated space of that proposition. How is this paradox formulated in the original poem? I’ve never been able to find the exact Japanese formulation. I imagine that Gyson and Burroughs paraphrased it, I’m not sure. It is also a collaborative practice, Renga that is. If I understand it correctly, poets are assembled in small groups and take turns composing stanzas of two or three lines. The resulting poems can be quite long. The first two stanzas differ in length. The third must make use of the structure of the first, and the fourth, that of the second, and so on. The poem progresses in this double way, at once even and odd. The poet must thus work inside the language of her predecessor, possessing and surpassing it. This is to conceive of a work as a kind of genetic chain, co-created by many. Can you tell me about the founding of Wendy’s Subway? I was brought into it by a friend, who absolutely wanted me to accompany him to the Cafe Orlin on Saint Marks Place to meet the group of poets that had been assembling to start this project. For a few months we would meet every now and then to talk about this space where we would be able to write together, surrounded by other writers. This was in fall 2013. Some of them had known each other for a few years…. I think they went to Orlin every Thursday to write. We visited a few spaces and finally we found one in a building of artist studios, a large studio. We were ten, and had a stack of books piled up on the floor. It was the dead of winter. We built all the walls and sat around and figured out how to get the electricity running and get some tables and bookshelves. Then we had a reading room. Initially we were interested in how to create a community around the book and catalyze the energy everyone had around writing and the social life of writing and of the book. We had several events very fast — readings almost every week. Today, what’s your role in Wendy’s Subway? We are eight on the managing board, and meet as often as possible. I mostly work on the library project, and on a few collaborations we’ve begun with two organizations in Mexico, Fundación Alumnos47 and Aeromoto. For A Critic’s Bouquet, what did your collaboration with Natalie Czech involve? Natalie Czech often works with writers, commissioning them to create a text that will eventually come to highlight the plasticity of language, its capacity to inhabit the visual field. For this project, Natalie asked art critics to write a review of an exhibition. She put together an index of flowers, arranged according to their seasonal availability. Each flower had a word or two beside it, indicating an affect or feeling. The task was to draft the text such that each phrase denoting an affect or a feeling or a condition would be matched, with a footnote, to a flower. In other words, if I wrote a sentence about sadness or melancholy, there was a flower in her index that had been commonly associated with that feeling. In the end, she made a bouquet of the flowers that were literarlly embedded in the text, which she photographed and exhibited next to a photograph of the review itself. I wrote about Camille Henrot’s The Pale Fox exhibit at Bétonsalon in Paris. Natalie told me my bouquet turned out the wildest and most incongruous. We could think that there is something meta-critical, or meta-conceptual in your approach. Maybe even a certain irony vis-a-vis critique. But I wonder if it isn’t simply an artist’s relationship to critique, an artistic use of the critical position. Yes you’re right. It’s funny, a friend of mine once told me she thought of me sort of as an artist. On the spot, I laughed because I really don’t know how to make anything — practically I mean — I don’t have any real knowledge of materials or processes, outside of those I’ve learned to write about art. But now I understand better what she meant, especially as a new kind of situation is coming into being, where artists are referring to themselves as “cultural entrepreneurs.” I always found that criticism is better when it participates, when it plays the game. My approach is a bit literal in this way, I mean I like to use the same words and the same language as the work or artist in question to better think in its terms. Sometimes when I am writing or curating, I start out a bit blindly — I find a topic that interests me but which I am not an expert in, to become completely immersed in it. I think this is also relevant: to have a practice that is not so self-assured — because assurance would be a form of foreclosure, of self-sabotage. Thus this attachment to questions of erasure, etc. I was going to say that this also has something to do with the question of possession. To be a critic is to take a position and possess a voice that must remain conscious of not dispossessing the work by bringing it into its semantic or meaning-making system. It is to assume a position but also to be able to erase oneself, to let the thing speak for itself. I wanted to speak with you about the question of the group, in a political sense. What do you think our generation is pursuing in relation to the history of the previous generation? I’m thinking of the generation of the seventies. Does Wendy’s Subway pursue something of that ideal? Yes of course — I think the question of the collective cannot exist outside of the political. At Wendy’s for instance, we were recently interviewed about our thoughts on the revolutionary potential of the independent library. For instance, in recent years, Occupy’s "People’s Library," which, despite some problems, really demonstrated that the independent library serves a very important function in terms of mobilizing people around intellectual resources, extra-institutional pedagogy, and other discursive structures in-formation. I recently visited the poet Susan Howe in her home in Connecticut. She kept repeating over and over again that "poetry is dead" until we finally asked her what she meant. I think for her a certain kind of conceptual writing signaled the end of poetry, but more interestingly for me, she spoke of the end of a historical moment where poets moved through history together, as part of what she called "a company." We ended up talking about the end of the world, acceleration, ecological disaster, and depleting resources. We were sitting there in her sun-drenched house imagining the term "community" as something infinitely subdividing, a kind of future primarily organized around small groups, small communities, creating their own means of survival, pooling together their resources. Wendy’s is a bit like this. I’m thinking of the group’s radical potential, but also of the radical potential of solitude and the ways we move back and forth between these two modalities: the way we must invoke support structures and the political power of friendship, empathy, and openness, alongside the admission that we don’t already know everything and we have to learn together. Economically this is also sort of what is happening. Yes exactly. We haven’t yet found a way to make our own food, but we have an economy of exchange, of intellectual trade. We work together. Have you read Céline Condorelli’s book? It’s called The Company She Keeps. Mostly it is a series of discussions on the subject of theories of friendship and community. It’s really beautiful — and it’s what we are trying to do — to create a support system. You once told me about a personal research project on the Minitel, through which your parents met. Are you still working on it? I am going at it very slowly. It needs archival research, and spending lots of time with my parents to interview them. A friend recently told me: if you want to write this book you should never talk about it! In the meantime I am doing research on the pleasures of correspondence. Do you think the final project will be a book? A book, or a long essay. Which I’m sure will also have something to do with erasure now that I think about it. Or at least, with the affective dimension of a certain kind of “blind spot” in pre-internet telecommunications.